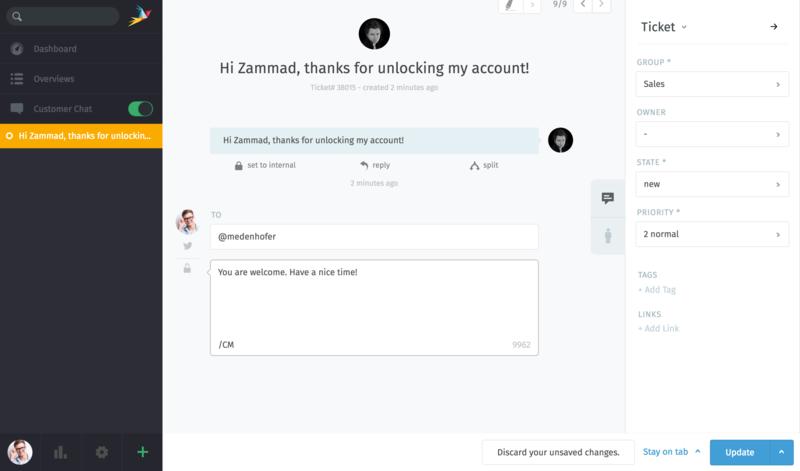 Zammad supports Twitter integration, meaning you can send and receive tweets and DMs just like emails! Twitter tickets will show a 🐦 Twitter bird in the reply area. Just click on the reply button (as you would for an email) to tweet back. Apply for a Twitter Developer account. Create a new Twitter app for Zammad. Set your new app’s permissions to Read, write, and access direct messages. Generate a new access token & secret. 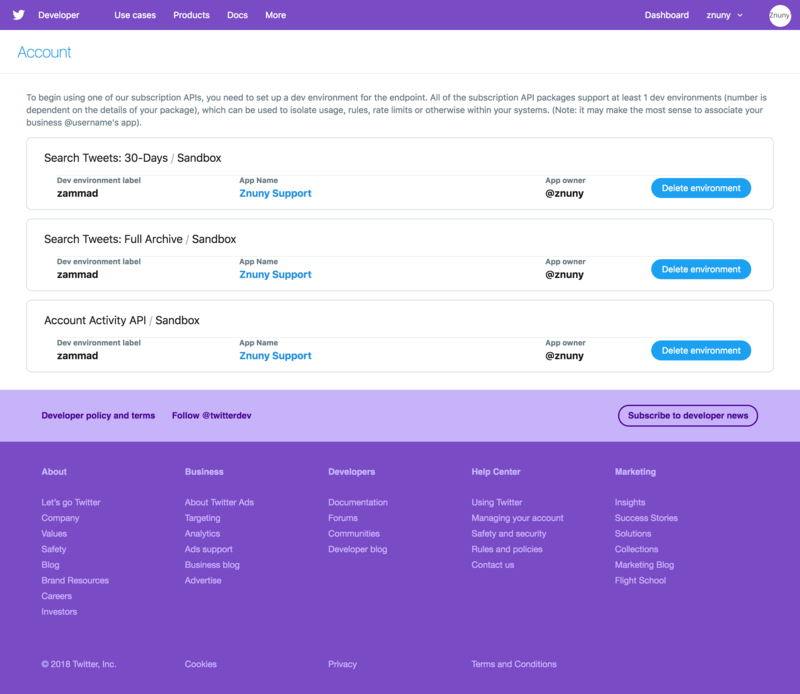 Set up a dev environment for the Account Activity API. Add your new Twitter app in Zammad. Add your Twitter account in Zammad. Configure filters for creating new tickets based on #tags and @mentions. Read on for details about each step. 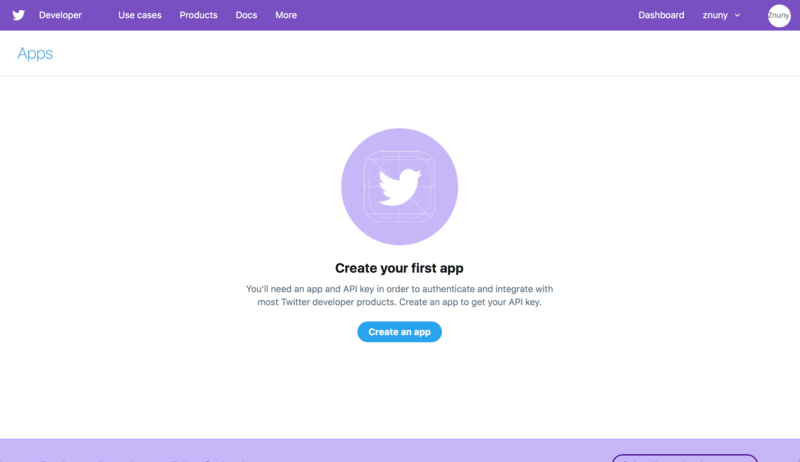 This welcome page is displayed after completing the application for a Developer account. 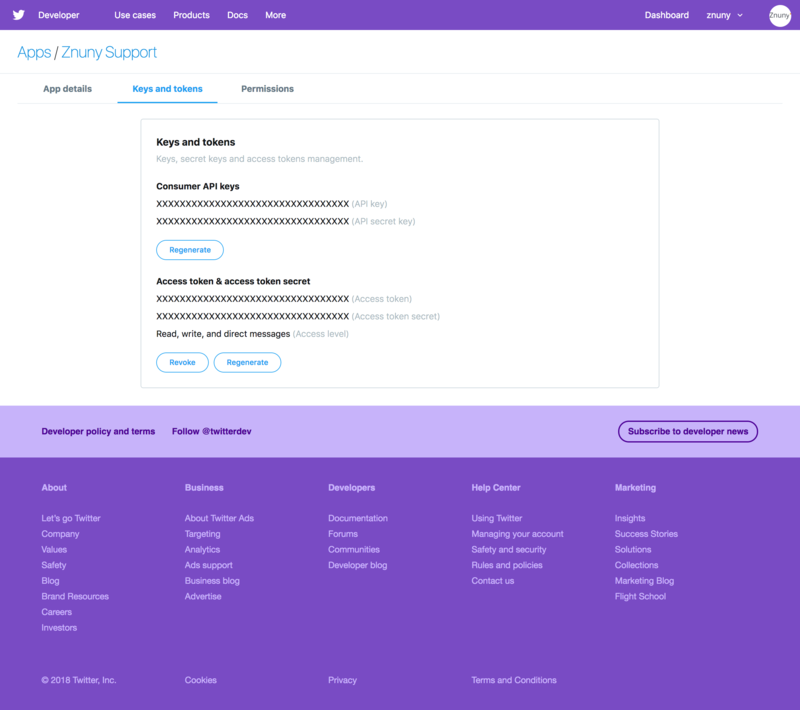 You will need a regular Twitter account with a verified phone number to apply for a Twitter Developer account (at https://developer.twitter.com). 1. To manage customer service communications for our organization. 3. Our use case involves posting original tweets in response to tweets and DMs we receive. We will not use the Twitter API to post or like “content”. 4. Our application will display individual tweets in their original form to authorized customer service agents of our organization only. To create a new app, select Apps under your user menu, then click Create an app. Must be unique across all of Twitter. No other developer account may create an app with the same name. The URL of your Zammad instance. 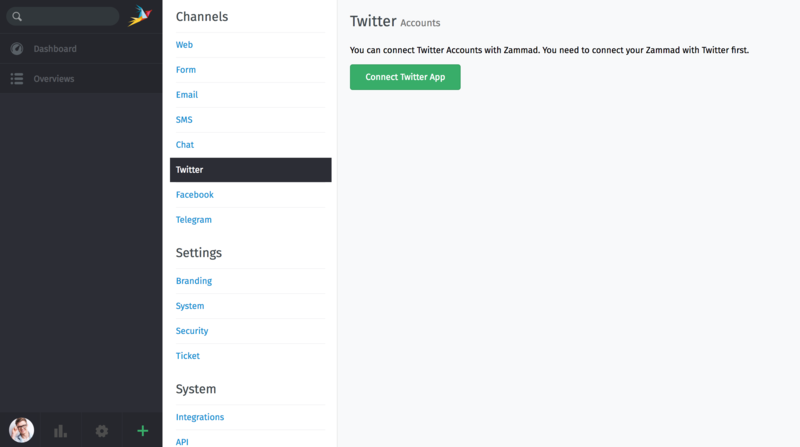 This URL is also visible in the Connect Twitter App dialog of your Zammad admin settings panel. This app will be used to manage Twitter communications between our customers and our organization’s customer service agents on Zammad. Select Read, write, and access direct messages. You will need all four keys/tokens later, so don’t close this tab. 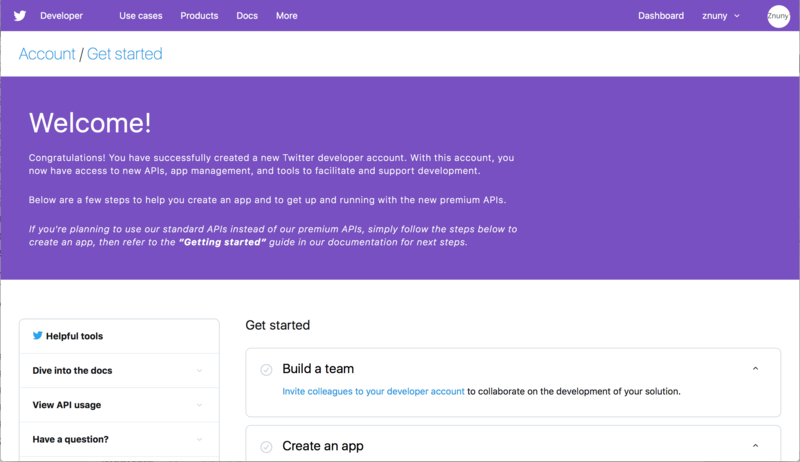 After creating your app, set up a dev environment for the Account Activity API. Name it whatever you like (e.g., zammad). You will need the label later, so don’t forget it. 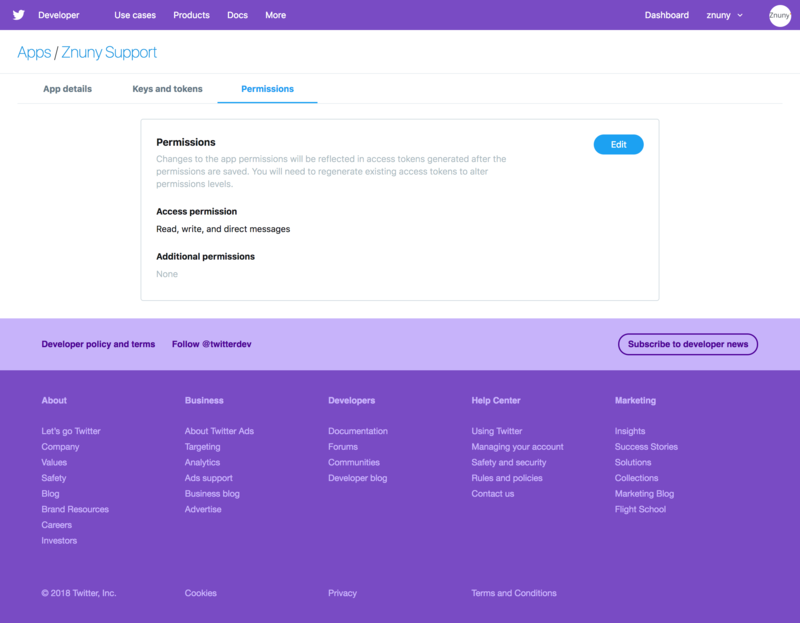 Add your new Twitter app under Channels > Twitter in the admin settings panel. You will need the keys, tokens, and dev environment label from Steps 4 and 5. 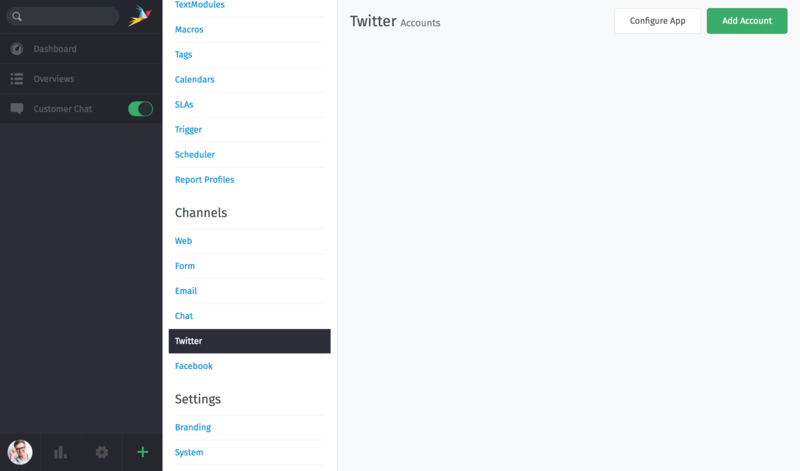 Click Add Account under Channels > Twitter in the admin settings panel. 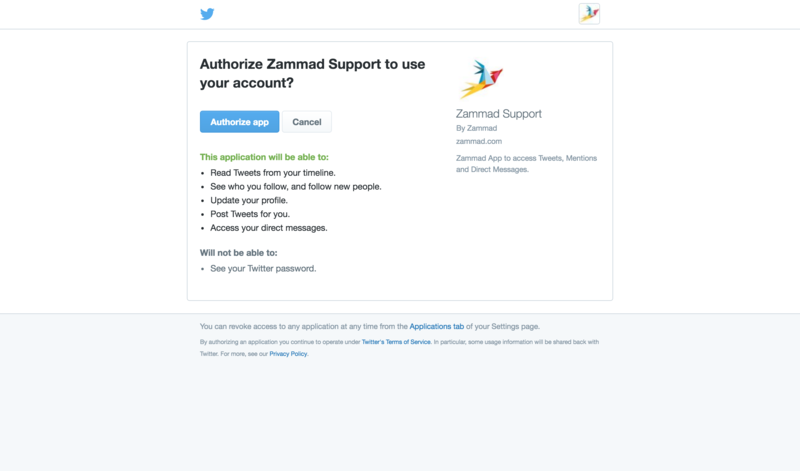 You will be redirected to Twitter and asked to authorize Zammad to access your account. 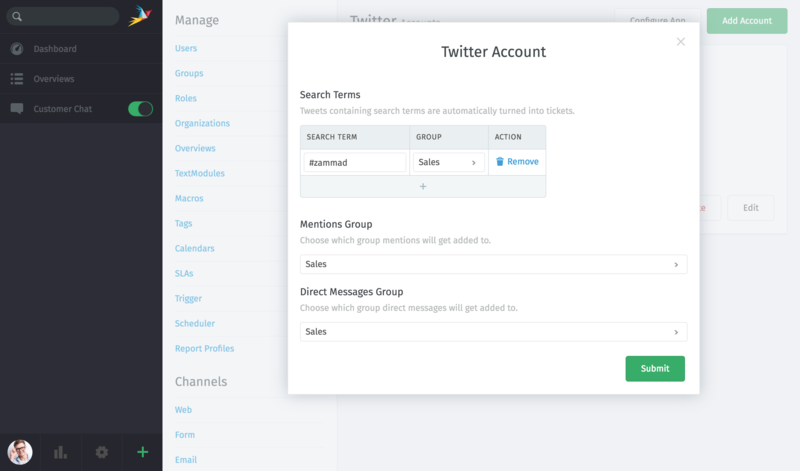 Set up filters to automatically create new tickets based on #tags or @mentions. That’s it! Now, incoming tweets and DMs will be automatically turned into Zammad tickets.